This textured fly line offers less drag and easier mending. 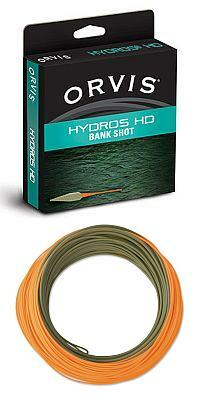 The Orvis Hydros HD Bankshot is a specialized fly line designed to deliver big flies using a number of different casting techniques, including single-hand spey and roll casting. The 23-foot head is designed to load and deliver quick casts with minimal back cast. 20-foot handling section between head and running line. Two-tone line offers a low-visibility olive tip for stealth deliveries, with an orange color running line for better tracking. The benefits of the textured lines are numerous: increased surface area allowed the lines to sit higher in the water, offering less drag, easier mending, less water spray, and easier pick-ups; the micro-textured surface traps air to provide increases in both shootability and flotation while decreasing friction; and the microreplicated pattern increased the durability of the lines, allowing them to last up to twice as long.